A native of Norlina, North Carolina and son of Howard A. Donald and Doris Donald. selected for four star rank and assigned in November 2004 as the Director, Naval Reactors, a joint Department of the Navy an d Department of Energy program responsible for the safe and effective operation of all nuclear propulsion plants on Navy submarines and aircraft carriers. Admiral Donald has received several military awards including the Distinguished Service Medal, the Legion of Merit and the Meritorious Service Medal. Additionally, he proudly served in numerous ships and staffs that were awarded recognition such as the Navy Unit Commendation and Meritorious Unit Commendation for outstanding team performance. Admiral Donald earned a Master’s Degree Business Administration from the University of Phoenix and is a graduate of Harvard University John F. Kennedy School of Government Senior Executive Fellows Program. Kirk, his wife Diane, and daughter Ashley lived in numerous locations during their time as a Navy family including seven different states, the District of Columbia, and Italy. Honoring Navy tradition, they embraced each community as their home, establishing lifelong friendships and supporting other Navy families throughout the world. Location. 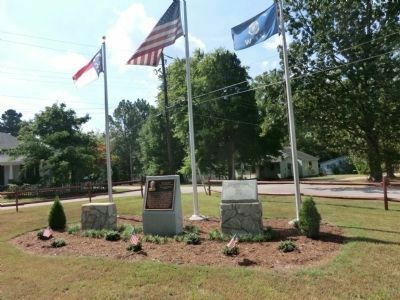 36° 26.461′ N, 78° 11.684′ W. Marker is in Norlina, North Carolina, in Warren County. Marker is at the intersection of U.S. 158 and Snipes Street, on the right when traveling south on U.S. 158. Touch for map. 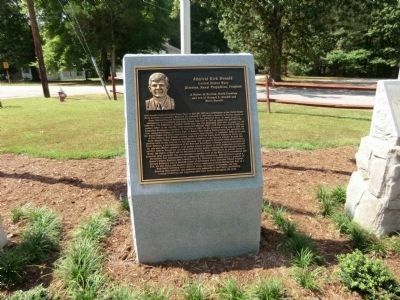 Marker is in this post office area: Norlina NC 27563, United States of America. Touch for directions. Other nearby markers. At least 8 other markers are within 4 miles of this marker, measured as the crow flies. Trading Path (approx. 0.4 miles away); Weldon Edwards (approx. 2.2 miles away); Warrenton Male Academy (approx. 3½ miles away); Bragg Home (approx. 3½ miles away); John H. Kerr (approx. 3.6 miles away); Horace Greeley (approx. 3.6 miles away); John A. Hyman (approx. 3.7 miles away); Jacob W. Holt (approx. 3.8 miles away). Touch for a list and map of all markers in Norlina. More. Search the internet for Admiral Kirk Donald. Credits. This page was last revised on June 16, 2016. This page originally submitted on November 4, 2013, by Don Morfe of Baltimore, Maryland. This page has been viewed 451 times since then and 11 times this year. Photos: 1, 2. submitted on November 4, 2013, by Don Morfe of Baltimore, Maryland. • Bernard Fisher was the editor who published this page.